New Cobblers loan signing Luke Williams is confident he has joined a club that will quickly steer clear of the choppy relegation waters it finds itself in. 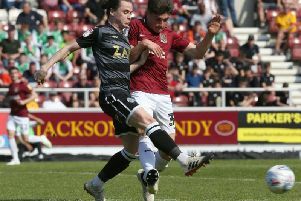 The Scunthorpe United attacker has signed on at Sixfields until the end of the season, and he is confident he can play his part in turning around the Cobblers’ dreadful run of form. Town have suffered 10 defeats in their past 12 Sky Bet League One matches, have lost five in a row, and haven’t won at home in the league since beating Bury 3-2 way back on October 29. They have slumped from play-off hopefuls to relegation candidates in the space of three painful months, a run that saw manager Rob Page lose his job and be replaced by Justin Edinburgh, but Williams is confident the tide will turn. The 23-year-old saw the Cobblers close up a fortnight ago as he was on the bench for title-chasing Scunthorpe’s 2-1 win at Sixfields, and he said: “I thought Northampton were a strong team and they made it really difficult for Scunthorpe. “We nabbed a goal late on, which was a great goal, but Northampton gave a good account of themselves and caused us a lot of problems. They looked a good solid side to me. “This is a team that shouldn’t be struggling with the players it has got, and the quality in the squad. Williams trained with his new team-mates at Moulton College on Friday morning, and he feels as if he has settled in straight away. “I trained with the players today,” he said.” We were at the complex at Moulton, which when I got there was massive and it took me a while to find the right place I had to be at! “But the facilities there were great, the lads were great and all of the staff were brilliant. “It is a good squad with good players, and they all seem like good lads. Williams began his career at Middlesbrough, starting at the Riverside as a nine-year-old and rising through the ranks before going on to make almost 50 first team appearances for the club. He enjoyed loan spells at Hartlepool, Peterborough, Coventry and Scunthorpe, before deciding to make a permanent move to Glanford Park in the summer of 2015, in the search of more game time. That worked out well in his first campaign with the Iron as he made 32 appearances, but he has found things tougher this time around after missing two months of the season with an ankle injury suffered in August. He has since struggled to regain his place in the Scunthorpe team, making just one league start, and that has led him to Northampton. “Scunthorpe are on a great run, and it is always hard to get into a team when everybody is playing so well,” said Williams, who is set to make his debut in Saturday’s Sixfields showdown with the Sky Blues. “But you just have to keep at it week in, week out, and do whatever you can, but I obviously didn’t get my chance and I have come here to Northampton to play games. “There has been talk about the move for a few weeks now, and when it came down to it I know a few of the lads here. “I spoke to them and they told me good things, so I was excited to come down and get started. So what sort of player can the Cobblers supporters expect to see when Williams walks out on to the pitch? “I would say I am a good technical player, and I have an eye for a pass, and an eye for goal as well,” said the Middlesbrough-born schemer. The Cobblers players will certainly be hoping he can do plenty of both over the next four months.